As the newest version, Exploring Chemistry with Electronic Structure Methods will provide you with the latest information about using electronic structure calculations to investigate various chemical problems. The Gaussian software package is used as a tool to help assist in exploring molecular systems and chemical reactions. It also discusses how to prepare input files and visualize results using the GaussView and WebMO graphical user interfaces. Exploring Chemistry will be helpful to most Gaussian users, from beginners who are just starting to use calculations to experienced users who want to become familiar with advanced modeling techniques and capabilities. Using calculations within a chemistry research project; overview of model chemistries. Basic calculation types and results: energies, geometry optimizations, frequencies; predicting fundamental molecular properties; ONIOM calculations; wavefunction stability. Studying potential energy surfaces; transition structure optimizations; handling challenging optimization cases. IR and Raman spectra; thermochemistry; NMR; conformational searching/averaging; anharmonic frequency analysis. Modeling compounds/reactions in solution; free energies in solution (the SMD model); handling explicit solvent molecules. Interpreting volumetric data; IRC calculations; PES scans. NMR shielding tensors and spin-spin coupling constants; VCD, ROA & ORD spectra; hyperfine coupling constants. Excited states (TD-DFT) and UV/Visible spectra; modeling fluorescence and emission; Franck-Condon analysis; state-specific solvation; CASSCF. ONIOM input for large biomolecules; relativistic effects; weakly bound complexes; counterpoise corrections; electronic spin organization; antiferromagnetic coupling. Background discussions of the major theoretical methods. The book includes an abundance of examples and exercises—all with detailed solutions and explanations—drawn from the literature and encompassing a wide range of chemical problems and research areas. Exploring Chemistry can be ordered here. J. 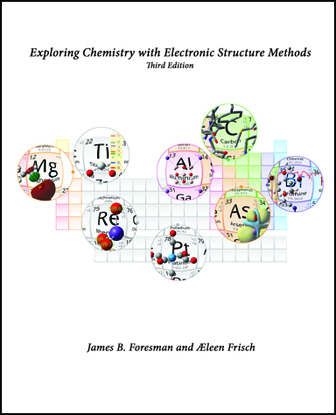 B. Foresman and Æ Frisch, Exploring Chemistry with Electronic Structure Methods, 3rd ed., Gaussian, Inc.: Wallingford, CT, 2015. Last updated on: 1 December 2017.